If you have an account on social networking websites, such as Twitter or Facebook, chances are that you have seen at least one image that has been uploaded and edited using the popular social photo-sharing application, called Instagram. Then, users can enter in some information about the photo, such as some text, describing it and whether or not they would like to geo-tag it, and upload it to the Instagram service. From there, other Instagram users can view, “like”, and comment on these pictures. This popular application also features the ability for users to share their photos on both Facebook and Twitter, which may have helped other people discover Instagram. However, Instagram is still only available on iOS enabled devices, such as Apple’s iPhone and other devices, mentioned earlier, leaving users of other smartphone operating systems, such as Android, wondering if Burbn, Inc., the application’s creator, would eventually release a version for the operating system that their phones run. 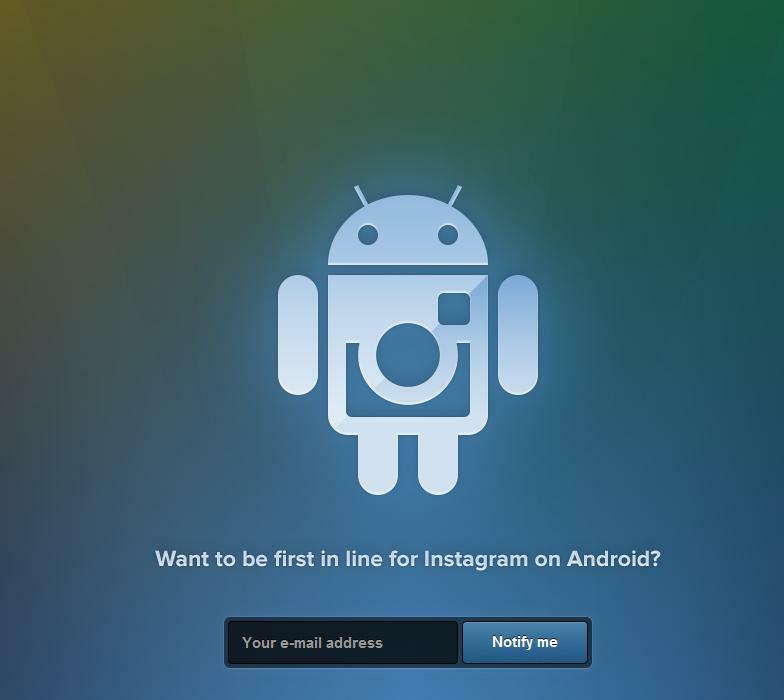 Now, however, Android users shouldn’t have to wait much longer for a version of Instagram compatible with their cell phones, as there is a relatively new page on the Instagram website, which displays an Android logo that has a camera set into it. Additionally, on the Instagram website’s homepage, there are two download links, one for the iOS version of the application, and one for the Android version, which says “Coming Soon”. When clicked, this button will take users to the aforementioned page, which is displayed above, where they can enter their e-mail addresses, in order to be “first in line” for the Android version of the application. Having been an Instagram user on the iPhone, I found the application to be fun to use, and also useful for adding some effects to photos, making them look better, perhaps setting the tone for the photo itself. However, having recently switched to the AT&T Fusion, which runs Android, I was no longer able to use Instagram, and instead of having the option of posting the original photo to websites, such as Twitter or Facebook, I was now forced to do so, or to find an alternative application. Though, now that Instagram is coming to the Android operating system, hopefully us Android users will be able to use Instagram again, or perhaps even begin using the application! As for when Instagram will be coming out for Android, the date is unknown, but hopefully it will be sometime in the near future! If you have a device that runs iOS and would like to try using Instagram, you can download the application for free from this link (may open iTunes if you have it installed on your computer). Also, if you’d like to visit the official Instagram website, you can do so at Instagram.com. This entry was posted in Uncategorized on March 27, 2012 by Jamie.